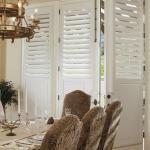 For the ultimate in style and insulated comfort, you can’t beat Wynstan Plantation Shutters. 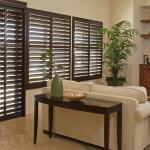 Count on Plantation Shutters to transform old windows with a modern look. These shutters feature practical hinged louvers to help moderate airflow throughout your home. You can hide away in total privacy and shield interiors from glare with tilted louvers, or swing shutters wide open to enjoy a refreshing breeze. Our Plantation Shutters are made from the finest timbers, giving a luxurious timber effect. For kitchens, bathrooms and laundries, Fauxwood Shutters offer the best of both worlds – the appearance of real timber, with superior moisture tolerance. Hinged, bi-fold or sliding? We create the best shutter solution for every home. 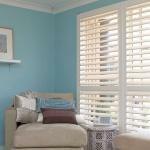 Shutters come in a frame and can be fitted to small or large windows. There’s a finish to suit every interior, with classic timber or several attractive neutral tones. Your Plantation Shutters will stand the test of time with quality materials selected for style and strength. For paint finishes, we use five coats of two-part polyurethane paint – giving you ultimate longevity with no fading, warping or peeling. Perfect installation is assured with our specialist team, and you can have peace of mind with our Wynstan Warranty. How long do these take to make? And do I need a professional installer? To get your blinds just right we, typically, allow up to six weeks for manufacturing. Our manufacturing staff take great pride in perfecting the size and color of your shutters – it’s the Wynstan Way! It’s because of this great pride in our product that we recommend you use our certified installers and save yourself and potential grief.